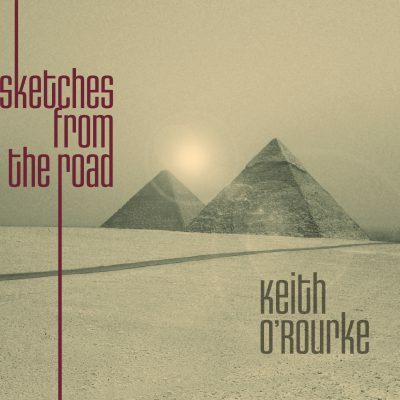 Saxophonist Keith O’Rourke comes from the Kenny Wheeler school of composition. His debut studio recording, Sketches From The Road, features his thoughtful approach to the saxophone, showcasing original compositions reminiscent of the ECM sound. Each song was inspired by his travels across the world, and paints an aural picture to evoke different emotions and reactions from the listener. Channeling the joy, anticipation and mischief he felt in the city, Keith composed “Port NOLA” in honour of his love for New Orleans. The track features a second line drum groove that likens to street bands, with stops and starts reminiscent of the French Quarter. “Drifting” brings the peaceful waves of the Caribbean Sea, shown through a gently shifting modal nature of the chords. “Solitary Traveller” shares the changing despair and optimism while trudging through the desert. “Sketch in Green” highlights his time in Dublin; learning a new culture and meeting new people. Keith infuses the playfulness of his early 20s that he spent living big city life in London with his composition “Bayswater.” Together, Sketches From The Road is an instrumental and semi-autobiographical look into Keith’s experiences and influences within music, and his naturally curious outlook on life as a whole.